Click Here To See Avengers #37 Comic Book! Don Heck's AMAZING professional career began in 1949 when he started working in the production department of Harvey Comics. Soon he graduated to penciling, and after a memorable stint at New Media Comics, he became a mainstay at Marvel, drawing mystery, Western, and war stories. When the House of Ideas began its Silver Age superhero revolution, Don Heck's first major success as a superhero artist was the legendary "VERY FIRST" Iron Man origin story in Tales of Suspense #39. He then drew a few early stories featuring Thor and Giant Man, but for most Marvelites, it's Heck's long run on The Avengers for which he is most fondly remembered. 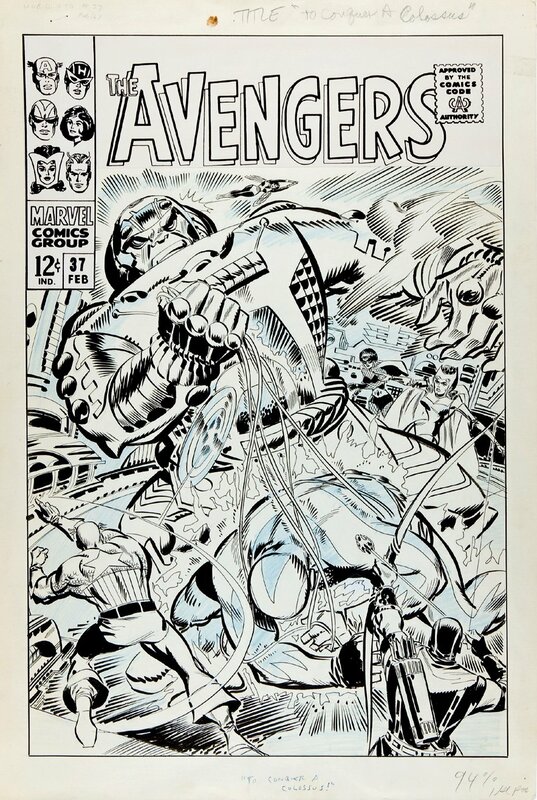 This LARGE ART size cover was created to be used for The Avengers #37 cover, which oddly enough has the Marvel Copyright stamp on the back of it! (Most unpublished covers do not have this copyright stamp on back of it, which tells us that this art was meant to be used for publication...but for whatever reason... it may have gotten lost, as the published cover (which is not nearly as good as this cover here) was the very first Avengers cover drawn by Gil Kane! 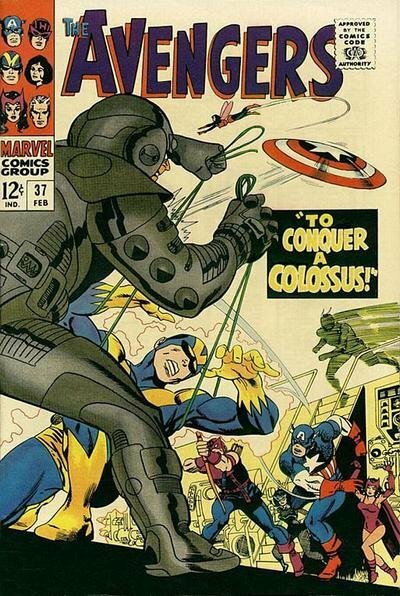 This GREAT BATTLE COVER titled "To Conquer a Colossus!" features Captain America, Goliath, Hawkeye, the Scarlet Witch, Black Widow, and the Wasp all being attacked in unison by the evil giant Ultroid! The logo area is a new stat addition and looks great. The overall drawn art image measures 13.4 by 20.25 inches on a larger 15.5 by 22.5 inch board and looks spectacular! Compare this nice cover art to the published comic book in the red link above! ALL HIGH end pieces of art, including this one, are able to be purchased with VERY fair time payment plan options, and trades are always considered towards this and "ANY" art on our website! Just send us an email to mikeburkey@aol.com and we can try to work something out.